Fantasy sports and OTT sports are a perfect match. We will explain in this article why every OTT sports provider should consider adding a fantasy sports game to their platform to increase a fan’s experience. Over-the-top (OTT) platforms are apps or services that distribute streaming content over the internet, bypassing traditional distributors such as cable TV. It is therefore also often referred to as direct-to-consumer (DTC). The best known examples are Netflix, Amazon Prime Video and Hulu. The main reason why these platforms are successful is because their content is adapted to our changing viewing habits (watch everywhere, anywhere) for a relatively low price. Cord-cutting (getting rid of your cable subscription altogether) continues to accelerate. In recent years OTT platforms focussed on sports have been popping up left and right. The OTT sports landscape is very fragmented because of the way sports rights are structured and sold (per country). It would be almost impossible for one OTT provider to create a monopoly without spending billions of dollars. And maybe the sports leagues themselves will be more inclined to develop and monetize their own channels in the future. So we can conclude that the OTT sports market will stay fragmented, at least for the years to come. The key for OTT sports platforms will be to have one or more differentiators to encourage fans to sign up and stay active. 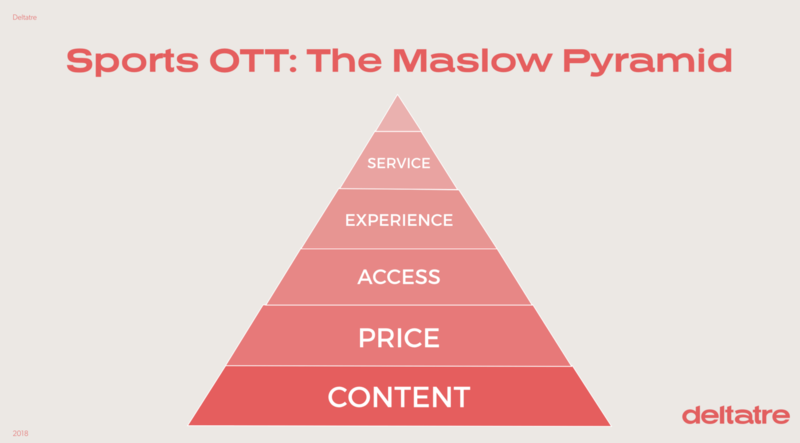 In the “Maslow Pyramid for OTT”, coined by Deltatre’s Carlo De Marchis, this is the experience layer. Fantasy sports is the catalyst to fulfill a fan’s needs. Let me explain this further. According to an IHS Markit thought leadership survey, the live OTT sports experience will see a high rate of innovation and a fast evolution of feature sets. One of those technologies is fantasy sports, which is built on data sources and interactivity, two components that will play a big role in the OTT experience. A more interactive and entertaining experience also means you should have zero friction between the live content, fantasy sports, news, stats and social elements. There is no need to offer e.g. a standalone app for your fantasy game. Keep it all in one place. Sports rights holders should therefore avoid partnering up with social networks, as it is seen as a short-term solution to invert a decline in subscriptions. Growing via your own platform with premium content and fantasy is the way to go. Three parts are essential in the experience layer: how you buy, how you discover content and how you consume content. How can fantasy sports improve the experience in these three phases? The fantasy insights should inspire you to make marketing content, read our blog post with 6 examples. ESPN is using insights on their ESPN Fantasy public in their marketing for the newly launched ESPN+ OTT service. Fantasy players spend more than average. Don’t underestimate the referral power of fantasy fans already on your platform. Creating a fantasy league for their friends is a reason for them send invites to friends outside the platform and to onboard them. Fantasy sports players log in multiple times a week to manage their team. They check player updates, upcoming matches and anything else that could give them and advantage to create a better lineup. These are perfect opportunities to promote your live schedule and create more pre-event hype. Normally you would see a big drop-off in visitors during the week when there are no live broadcasts. With a fantasy sports game you give your subscribers a reason to come back. Fantasy sports doesn’t only use a lot of data, it also generates a ton of user insights. This data can be used to create a personalized experience for each of your subscribers. An active fan will benefit from seeing news and highlights from players in his or her fantasy team. New technologies such as player tracking will allow big and small sports to capture more data such as distance travelled, possession, decisive passes, etc. It will offer more insights into the sport, but it would be also very valuable to use in the a unique fantasy game rule set. In November 2018 Eleven Sports introduced the watch together feature so fans can watch their content simultaneously with friends and family. Discussion during live streams is also one of the foundations of the ever-growing Twitch platform. Fantasy sports and banter go hand in hand. Even die hard cycling fans will admit: a sprint stage in the Tour de France can be very boring sometimes. Introducing a live game mechanic (eg. activating a boost) in a fantasy game can spice things up. It’s another way to keep viewers on the platform in an “always connected, always distracted” digital world. Fantasy sports can enable a more interactive, social and engaging OTT experience. This kind of behaviour is valued by advertisers and sponsors. In another blog post we have already talked about how publishers can effectively monetize a fantasy game. This is also applicable to OTT sports platforms to grow new income streams. Read more: Creating new revenue streams for publishers with fantasy sports. Let’s conclude the article with one of the best examples out there: the NBA G League. The official minor league basketball organization broadcasts live matches on Twitch and it features an interactive layer with loyalty points, player boosts, polls, stat comparisons, play-by-plays and more. Contact us to discuss how a fantasy sports game can be the catalyst to take your OTT platform to the next level.